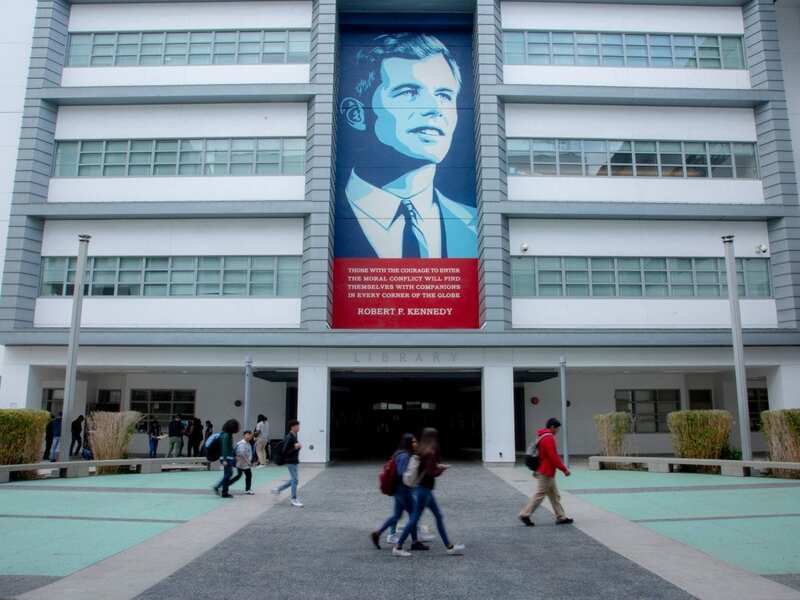 “Many of the students were being bused all over the city and there was not an opportunity for them to go to a neighborhood school,” says RFK High School of the Arts Principal Susan Canjura, standing beneath a colorful mural of Kennedy breaking bread with labor and civil rights leader Cesar Chavez. It mirrors a second mural at the library’s opposite end, both by Los Angeles artist Judy Baca, which depicts Kennedy campaigning as a sea of hands, black and white, reach toward him, toward the sky and the stars. “Part of the library does include the area where Kennedy was shot, the kitchen. And it’s now behind the librarian’s desk,” Canjura says. An older generation, too, especially those who lived through Robert Kennedy’s death, are still wrestling with his legacy and relevance for today’s America. Scott had just turned 15 five decades ago when he heard that the train carrying Kennedy’s body would pass near his small town of North East, Md., near the headwaters of the Chesapeake Bay. “He seemed like a decent man. He wasn’t one for posturing. He wasn’t big and blustery,” he says, adding that he still tears up when he hears Kennedy’s speech the night Martin Luther King Jr. was assassinated. Kennedy stood before a group of crestfallen and angry African-Americans in Indianapolis and called for unity. Scott and his mom were among the estimated 1 million Americans, regardless of color or ethnicity, who lined stretches of train track from New York to Washington, D.C. to Kennedy’s burial journey to Arlington National Cemetery. The spontaneous mourners paying a last respect, one writer said, marked a “long sad human chain” of mourning. He didn’t expect to see the man “I thought was David” trying to slay the Goliaths of racism, poverty and war mongering, he says. Scott would later realize that was his ‘cleaning the mirror’ moment. “I was kind of in a blur, you know. It’s like losing a close member of the family” says Georgetown law professor Peter Edelman, who knew RFK and worked as one of his legislative aides in the Senate from 1964 until the end. Edelman attended the funeral at St. Patrick’s Cathedral in New York City and rode the funeral train down to Washington. Edelman says the sense of loss was especially hard for those who felt marginalized. “Particularly people of color, people who were farm workers. Young people. Their loss, if anything, was even more terrible,” Edelman says. A show at San Francisco’s Museum of Modern Art captures the extraordinary power and resonance of that funeral train. “The Train: RFK’s Last Journey” chronicles through three distinct artistic lenses what some have said may have been one of the last times America felt truly united. Some of Scott’s memories are part of one section called The People’s View. Dutch artist Rein Jelle Terpstra crowd-sourced and curated photographs and home movies made by the spectators themselves. “And as I sat down there was a lady who came up in a wheelchair with her husband standing behind her. And I motioned for them to put headphones on,” to hear the sounds and interviews. Teachers, parents and those who lived through it know it’s a challenge making that history and Kennedy’s larger life relevant for today’s teenagers. “I pray that there’s something that they (students today) can glean from his legacy of fundamental decency, a sense of justice,” Scott says. RFK High School of the Arts teacher Elizabeth Mora says Donald Trump’s presidency and the growing divide in the country has proven to be one large teachable moment. She says she tries “to help them understand that these are fights that people have been fighting a very long time.” Mora has taught cultural geography and Advanced Placement government at the L.A. school for more than a decade. Yet the current political climate and White House policies have proved to be challenging for many of her students, a majority of whom are Latino. Many are rattled, she says, about the Trump administration’s crackdown on illegal immigration; the practice of separating immigrant parents and children at the border; and the way the president sometimes talks about women and people of color.